Diego Luna-Alexander (Spanish pronunciation: [ˈdjeɣo ˈluna]; born 29 December 1979) is a Mexican actor known for his childhood telenovela work, a starring role in the film Y tu mamá también and supporting roles in American films, including Rudo y Cursi, The Terminal, Elysium and Milk. He also starred with Romola Garai in Dirty Dancing: Havana Nights and provides the Spanish language narration for the National Geographic Channel documentary Great Migrations. Luna was born in Mexico City, the son of Fiona Alexander, a British costume designer, and Alejandro Luna, a Mexican set designer, who is one of the most acclaimed living theatre, cinema and opera set designers in Mexico. His mother died in a car accident when he was two-years-old. She had worked in the film industry and had made sure that this was a life in which Luna would be immersed. His father also reinforced the importance of theatre and the arts in his life. When Luna was a child his father would bring him to the sets and mentor him in different aspects of art, furthering in him a desire to become an actor and uphold the family tradition. Luna wed Mexican actress Camila Sodi on 5 February 2008 and they had a son Jerónimo (born 12 August 2008) and a daughter, Fiona (born 1 July 2010) who is named after Luna's late mother. They announced their separation in March 2013, and later divorced. He and Gael García Bernal co-founded Ambulante A.C., their organization and film festival that works to bring documentary films to places where they are rarely shown. Ambulante was awarded the Washington Office on Latin America (WOLA) prestigious Human Rights Award in 2011. Luna now sits on WOLA's Board of Directors, and in January 2015 he narrated a WOLA video examining the barriers that Mexican migrant children fleeing violence in their home country face to seeking refuge in the United States. From an early age, Luna began acting in television, film and stage, his film debut was Antonieta (1982). His next role was in the telenovela El Abuelo y Yo (1992) with his childhood best friend, Gael García Bernal. In 1995, he played the role of Laura León's troubled son Quique in the Mexican soap opera El premio mayor. Luna also starred in the critical acclaimed film Y tu mamá también (2001), once again alongside Bernal. He currently made a name for himself in the United States market, having starred alongside Jon Bon Jovi in Vampires: Los Muertos (2002) and the Academy Award-winning Frida (2002). He also starred in Open Range, Dirty Dancing: Havana Nights, The Terminal and Criminal. In 2008, he starred in the Harvey Milk biopic Milk as his emotionally unstable lover, Jack Lira. Luna and Bernal own Canana Productions which is recently joined with Golden Phoenix Productions (owned by producer Tom Golden of Hot Springs, Arkansas) to jointly produce a number of television documentaries about the unsolved murders of more than 300 women in the border city of Ciudad Juárez. For the fourth time, Luna and Bernal starred in the American Spanish-language comedy film Casa de Mi Padre with Will Ferrell. In 2011, Luna played the male lead in Katy Perry's music video, "The One That Got Away". In June 2012, he began directing his first English-language film Cesar Chávez, a biopic about the life of American labor eponymous leader, who founded the United Farm Workers. In March 2015, he joins the cast for Ana Lily Amirpour's cannibal romance film The Bad Batch. In 2016, he was a member of the jury for the Un Certain Regard section of the 2016 Cannes Film Festival. He played Captain Cassian Andor in Rogue One. ↑ "Diego Luna and Camila Sodi Welcome Son Jerónimo". People. 15 August 2008. Retrieved 19 April 2011. ↑ Leon, Anya (2 July 2010). "Diego Luna, Camila Sodi Welcome Daughter Fiona". People (magazine). Retrieved 19 April 2011. 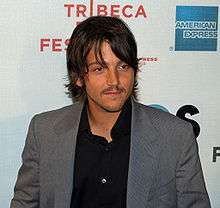 ↑ "Diego Luna and Wife Announce Split". Fox News Latino. 25 March 2013. Retrieved 23 June 2013. ↑ McNary, Dave. "Participant Marches With 'Chavez'." Variety. June 5, 2012. 1 2 Wilkinson, Tracy. "Diego Luna's Cesar Chavez Movie Marches in Mexico." Los Angeles Times. July 1, 2012. Accessed 2012-10-14. ↑ "Un Certain Regard Jury 2016". Cannes Film Festival. 28 April 2016. Retrieved 28 April 2016. 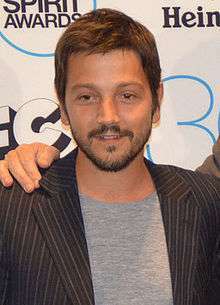 Wikimedia Commons has media related to Diego Luna.